A U of O business school grad who has worked at Nike in marketing, Autodesk in sales, and Nordstrom buying women's shoes (! 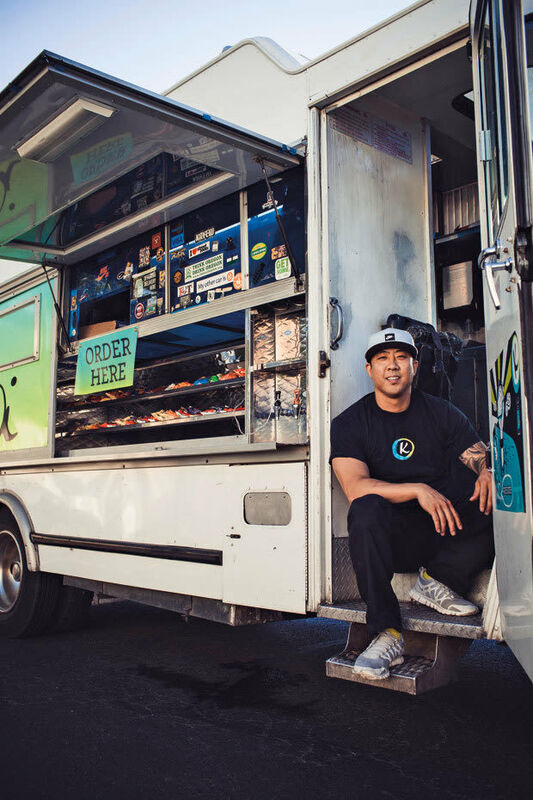 ), Kwon rolled out his first taco truck in 2009, using secret family marinades to create a cultishly popular mash-up of Korean BBQ and fresh Mexican flavors. KOi Fusion now boasts three mobile trucks, multiple stationary locations, and a catering division---great news for cool, foodie newlyweds-to-be who say "I do" to bulgogi beef sliders, Korean hot dogs, and kimchi quesadillas. 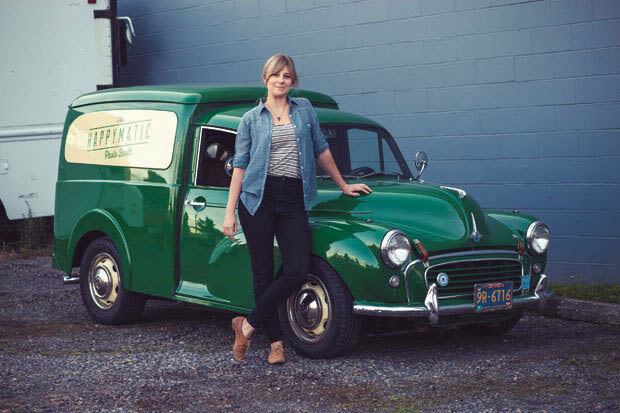 Q | What should cart-curious Portlanders keep in mind? A | A food cart wedding and a full-service catered wedding can be two very different things. Carts will usually bring all paper goods and can likely provide alcohol, but most won't set up tables, organize rented place settings and glassware, or include servers/bussers, although some may offer these services for an additional cost. To combat lines, I'd suggest having a limited menu on the truck along with our more traditional family-style service and waitstaff. We also offer delivery-only and in-house build-your-own, staffed, or plated tacos, but to have the full KOi Fusion experience, you need to have the truck present at some point---it creates a laid-back vibe and showcases a little Portlandia for your out-of-town "framily." Q | Have any tips for couples on a tight budget? A | If you compare us to traditional catering, we're a fraction of the cost already. Limited menus (only rice bowls, burritos, and tacos), smaller offerings (like just all-you-can-eat Kalbi short rib, beef, chicken, pork, and spicy tofu tacos), or bringing us in for just the after-party will usually make it work for less. Q | How about pairs who want something extra special? A | Do the whole menu, plus sweet treats from our dessert partners, Kyra's Bake Shop and Salt & Straw---we're happy to scoop! One of the coolest setups I've seen is a couple who brought in three food trucks and a drink-and-dessert cart and created the cutest little Asian-style night market experience with lights and candles, live music, and kids running around with their parents to try different trucks. It really gave out-of-towners a true feeling of a food cart pod, with all the comfort of their backyard. It was really amazing. Q | Can you share the cart catering basics? A | Be certain you get your date request in at least a year in advance. But before that, check out the catering menu and ask about service fees, possible travel fees, contracts, and deposits. Of course, it's also necessary to clarify size requirements and location access up front---we've been asked to park in some sketchy or remote situations, like a barge on the Willamette or Mount Hood in the middle of winter. Make sure that the area where the food cart will park is level, dry, and free of debris, and ask for the dimensions of the truck, what side the service window is on, possible power needs, and the timing for setup and breakdown. Don't forget that carts are also great for rehearsal dinners and bachelor or bachelorette parties! "We've catered some beautiful black-tie weddings with dinner served from two trucks! Just set your guests' expectations and have fun with it." Most beers pair great (we love Base Camp's In-Tents IPL and Hop Valley's Citrus Mistress IPA), and a crisp Northwest pinot gris is especially stellar with spicy bites. Already a freelance photographer specializing in portraiture, Taylor sat down for her first wedding consultation in 2008 and was asked to make a station where guests could use a remote control to take their own picture. Her own interest quickly became cheerful obsession, and within a year she was building and renting out booths full-time. The simple process: pose, snap, and your loved ones get a good-times memento photo strip to have and to hold in 15 seconds flat. Q | From old-school structures to futuristic green screens, photo booth options abound. How can a couple cull the herd? A | Start with websites---they'll typically display a company's personality and taste, and get right down to the nitty-gritty like fees, space and electricity requirements, and setup options (e.g. level grass on a nice day, yes; gravel hill in a thunderstorm, no). Look for full galleries of ultra-flattering, high-quality images (that guests can download for free), and images of the booth itself to ensure it suits your venue. Ours is solid black walnut, which is great for Northwest events, and it's open air. This setup allows for more people than a traditional closed curtain booth (our record is 15), there's a larger range of motions possible (jumping, firefighter carrying the bride), and you could use part of the venue (brick wall, barn, mural) as a backdrop. Q | What's your advice for making the most of the booth? A | Props are the best thing in the world! We've seen 90-year-old women dress up like shark-bears, groomsmen in animal masks, and flower girls in boxing gloves. Tropical, superhero, under-the-sea ... whatever theme your hearts' desire, we bring curated vintage and handcrafted accessories to match. We can also do cute custom backdrops like a chalkboard or an enlarged postcard of the city where you got engaged, but couples on a budget can bring their own and we'll hang it for free. Want more? We'll project a real-time slideshow of your images. Q | Tips for ensuring the booth gets used? A | The best time to turn the booth loose is right after dinner. Have the DJ make an announcement or pick a visible spot, like next to the bar or near the dance floor. Also think about making the booth part of an entertaining guest book experience---guests leave a copy of their photos along with a quick note. People actively seek the guest book out so you increase the chances that even the most modest guests will take a turn. Did I mention we meticulously handcraft our guests books right here in Portland? You really want one! High school in the late '80s meant Bon Jovi and Def Leppard in his Walkman, natch, but it was Whittemore's desire to share an appreciation for all music (big band! polka! hip-hop!) 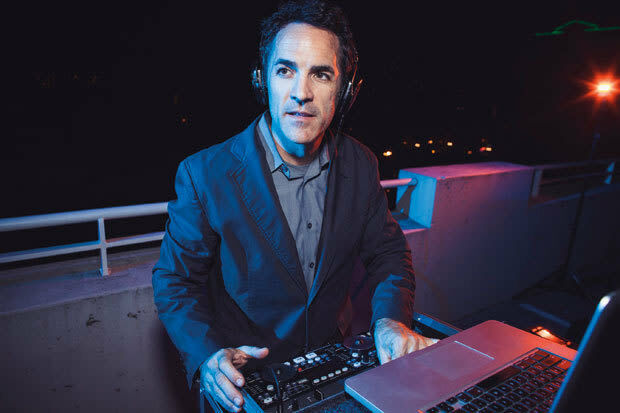 that led this DJ and master of ceremonies to found Event Team Entertainment 17 years ago. Now a certified Wedding Entertainment Director with 1,750 events under his belt, he'll keep your festivities footloose, fun (think clever trivia games to release tables to the buffet), and tastefully on track. Q | What should couples look for when scouting DJs? A | It's helpful to check out reviews on Wedding Wire, The Knot, etc., but after you've narrowed the field, meet and interview in person at least three providers---the actual DJ/MC that you would work with at your celebration. Ask questions about them personally and professionally (like what's their favorite thing to do when they're not DJing, do they have backup equipment in case of failure, and what would they wear to your wedding?) to get a feel for their work and style. Ask for references (three former clients who enjoyed working with them), and see if they have any video of themselves in action. You want a DJ who is well versed at mixing music, reading and responding to the audience, and directing the night's pacing and flow. Many companies also provide services like up-lighting, photo booths, slide shows, and theatrical effects for special moments. Q | Some couples groove on Billy Ray Cyrus while other go gaga for Beyoncé, but in general, what genres draw the biggest crowds to the dance floor? A | Motown, '70s disco, and funk seem to always get a positive response because it's feel-good music with great beats and energy, and if you're familiar with a tune, you're more likely to dance to it. Classic rock and hits from the '80s and '90s typically have great success as well. I always caution against having a narrow focus; consider your "audience" and have a wide range of music to keep everyone happy. Set the tone early with current pop folk, electro-swing, or Top 40 instrumentals during the cocktail hour and dinner---you want your guests tapping their toes. Q | Can you spill the wedding DJ brass tacks? A | Like all vendors, the best DJs in the business get booked 12-18 months in advance. Expect to pay anywhere from $750 to $3,500. Never feel pressure to tip, but it can be warranted at the conclusion of the evening if your DJ/MC goes above and beyond. Those who make it their full-time profession will cost more, but they'll be more available to you as well as ensure you have the time of your life and make it look easy.